Welcome to the first Wimbledon installment of LiveAnalysis! Today’s match features two men with plenty of firepower (of the kind that produces great shots, as well as the verbal variety): World Number 7 Jo-Wilfried Tsonga vs. World Number 39 Ernests Gulbis. Both gentlemen won their opening rounds in straight sets: Tsonga defeated Goffin, while Gulbis took out Roger-Vasselin. As a warm-up for Wimbledon, Tsonga played Queen’s Club, where he lost in the semifinals to eventual champion Andy Murray. Gulbis, on the other hand, played in Halle, and lost in the second round to Tommy Haas, a man he’d beaten earlier in the year on his way to the title at Delray Beach. As you can see, Jo and Ernests haven’t met in nearly four years. And today’s meeting is the first that’s not on hard court. It’s interesting that the last two meetings between these two entertainers have gone the distance. That Bangkok triple-tiebreak extravaganza sure seems epic. Jo-Willy is an excellent grass court player: he boasts a 34 and 12 lifetime record on the surface, to go with two straight semifinal appearances at Wimbledon. Ernests Gulbis, on the other hand, is 7 and 12 lifetime on the slippery surface. The Latvian has never made it past the second round at Wimbledon. Last year he seemed destined to at least get that far, since he took out Tomas Berdych in the first round. However, then-unknown Jerzy Janowicz took out Gulbis in five sets to deny the Latvian passage into that elusive Round of 32. In a partially related note, Gulbis has played Queen’s Club 6 times, and he’s lost in the first round 5 times. These two play at a pretty quick pace: even though they have three tiebreakers among the eight sets of tennis they’ve played against each other, they average 35.75 minutes per set. Notice how there aren’t any breadsticks or bagels in their head-to-head. 1. Who will be able to hold serve more efficiently? Both men have huge deliveries, and neither is a particularly adept returner of serve. There’s a reason why one of their matches involved three tiebreakers: when their serve is humming, both guys are tough to beat. Also, one would think that whoever holds serve with greater ease will be able to loosen up and take a few chances on return games. Then again, these two take chances all the time, so I’m not sure they need to hold serve quickly in order to do ill-advised things on return. 2. Will Ernests Gulbis be able to turn most rallies into AD-court exchangs? The Latvian has a significant edge with his backhand over Jo, but he’s far from being tactically disciplined enough to take advantage of this strength of his. 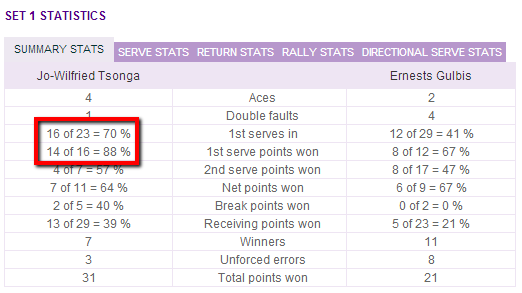 Still, if he is discplined, it’ll be interesting to see how Tsonga’s unreliable backhand responds. 3. Can Gulbis’ Jazz Hands forehand survive against Jo’s excellent counterpart? This is likely to be the key of the match: Gulbis’ weird stroke is prone to breaking down at the worst possible times, and everyone on tour must be dying to grind that shot into the ground. Jo’s normal pattern of play is to try and dictate with his forehand, so Gulbis’ off-beat shot presents itself as an easy target. First Set – Ernests Gulbis will serve first. 0-0: We start off with a bang, apparently: a very long rally ends with Gulbis netting a DTL FH. An auspicious start, to say the least. Another long BH-to-BH exchange, and this time Gulbis nets a DTL BH. 0-30. SW out wide, 15-30. DF #1, and it’s 15-40. Jo-Willy will have his first 2 BPs of the match. A SW up the T saves the first – a monstrous serve. The 2nd is saved by a brilliant BH DTL winner that BARELY catches the sideline. Deuce #1. SW up the T, AD-Gulbis. Another huge up-the-T serve nets a very simple putaway, and Gulbis has escaped. So this match has gotten off to a rousing start. More of that, please. And given the carnage at Wimbledon today, may we have no further injuries. Enough is enough. 1-0, Gulbis: Ernests plays a pretty great 1st point, but then Jo-Willy serves his way out of the slight discomfort and holds to 15. 1-1: An errant Jazz Hands FH gives Jo-Willy triple break point at 0-40. The men engage in a FH-to-FH exchange, and predictably, things go badly for Gulbis. He nets a FH DTL, and Tsonga is up a break. As I mentioned in the notes above, Gulbis is far from a decent grass court player. Jo-Willy is making his superior pedigree on this surface count, as well as his huge edge in FH-to-FH exchanges. 2-1, Tsonga: Jo plays a flawless, dazzling service game, and consolidates the break at love. 3-1, Tsonga: Gulbis wants to show off some grass court skills, and races to a 40-0 lead. Soon after, he holds. 3-2, Tsonga: Jo fires 3 straight aces and then a service winner to hold at love once again. 4-2, Tsonga: Gulbis comes up with an absolutely hilarious Jazz Hands FH UFE. He was standing inside the baseline, and it was a sitter. Missed by about 15 feet. No matter, he’s up 40-15, and holds after a horrific Tsonga drop shot that lands wide. This match got off to such a nice start…but has petered out since. Hopefully these guys can get it going again – fun things happen when they’re playing well. 4-3, Tsonga: Jo barely misses a counter-dropper DTL, and it’s 30-all. Jo then botches a FH, and out of nowhere, Gulbis has his first BP of the match. However, Jo saves it with a gorgeous drop volley off a very nice FH I-O approach. That was pretty. And timely. Deuce #1. A supremely fun point follows, with Jo covering the court in incredible fashion, but Gulbis is there to put away an awkward volley. BP #2 for Gulbis. However, the Latvian botches a return that was very, very makeable. Deuce #2. Ace up the T for Jo, and he has a GP. SW out wide, and Gulbis’ chance to get the match back on serve has vanished. 5-3, Tsonga: Gulbis puts a FH in orbit via a shank, and he’s down 15-30. Ace out wide levels it at 30-all. Jo then comes to net after a great FH DTL approach, and ends up putting away a simple volley. 30-40, SP. He wants to come forward…but buries a BH DTL slice approach into the net. Deuce #1. But then, 2 straight DFs hand over the set to Jo-Willy. 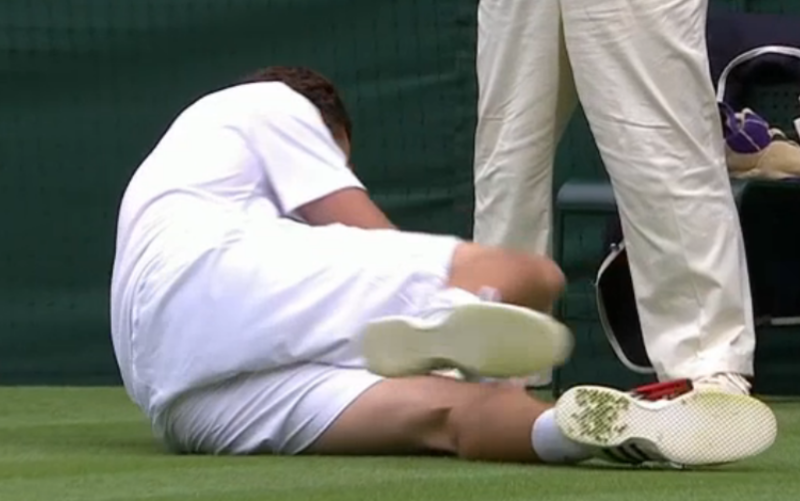 What an atrocious way to end the set for Ernests Gulbis. Not more can be said after that disaster. First Set to Jo-Wilfried Tsonga, 6-3. No first serves for Ernests, no joy for him. 41% is much, much too low. Second Set – Jo-Wilfried Tsonga will serve first. 0-0: Jo is up 40-15, but a bad serve & volley attempt plus an errant FH make it Deuce #1. The pair trade UFEs, so it’s Deuce #2. Jo then digs a volley straight from his shoelaces, and Gulbis can’t handle the drop-volley. AD-Jo. SW out wide, and he holds. Huge service game coming up for Gulbis. First serves would help, obviously. 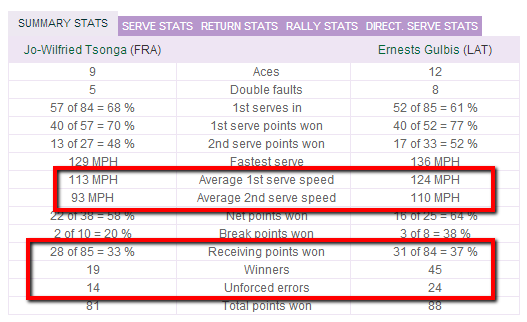 So would more BH-to-BH exchanges: Jo is (predictably) dominating the FH-to-FH ones. 1-0, Tsonga: Gulbis’ Jazz Hands FH nets an UFE at 30-all, and then he DFs to give Jo his first BP of the 2nd set. They play a fun point, Jo comes forward, but can’t get a makeable volley over the net. Deuce #1. Ace up the T by Ernests, and he has a GP. The pair then exchange slice BHs, the crowd somehow finds that amusing, and Gulbis comes up with the UFE and then stares at the crowd. Deuce #2. Ernests comes to net, and Jo hits a ridiculous flick one-handed BH pass, but Gulbis puts away the volley. AD-Gulbis again. Moments later, he holds. Gulbis is hanging by a thread in this match. And by a thread, I mean his FH. 1-1: Jo has a comfortable hold to 15 with very little fuss. Hit a very pretty volley at one point. 2-1, Tsonga: Hot service game for Gulbis, who blasts away and holds at love. An awkward tumble, but he seems to be fine. At 40-15, he has a chance to pass Tsonga, goes hard for the body, Jo ducks, and Gulbis’ FH misses the baseline by about 5 feet. Another easy hold for Jo. STATS UPDATE: Gulbis has righted the ship in a big way in terms of 1st serve %: he’s all the way up to 79%. That’s a very high number, but if he can at least keep himself in the mid-to-high 60s, good things can happen to him. Sadly for Gulbis, the UFE doesn’t look good: 7 FH UFEs, just 1 BH UFE. 3-2, Tsonga: Gulbis was up 30-15. But then a FH UFE and a BH UFE make it 30-40, BP for Jo. Tsonga has a look at a very, very attackable FH, decides to go I-O instead of I-I, and nets it. Bad UFE. However, a simply spectacular overhead smash by Jo gives him another BP. Jo comes up with a very deep return, Gulbis’ reply is called out, he challenges, and we see that it barely caught the baseline. 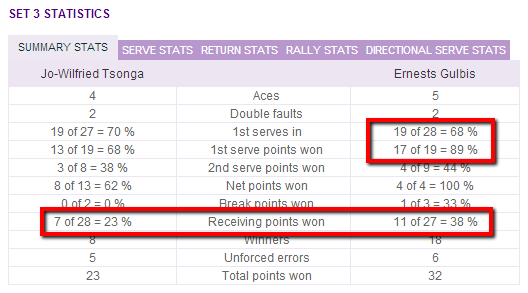 Replay the point, still AD-Tsonga. Gulbis comes to net, and hits a very, very good drop volley. Deuce #2. SW bomb out wide, and it’s AD-Gulbis. Another Gulbis net approach, and Jo botches the pass. A great hold for Gulbis – Jo is putting a ton of pressure on his service games in this set. Constantly under siege. 3-3: Gulbis slips again, but later on he hits a great BH DTL pass to go up 15-30. Great 2nd serve, and it’s 30-all. Ridiculous kicker. SW again, and it’s GP for Jo. He S&Vs, but Gulbis’ return is too good, and Tsonga sends the volley long. Deuce #1. Gulbis hits a great return, comes to net, and for some bizarre reason, Jo goes for a 1-handed BH pass. He nets it, and Gulbis has a BP. Which he converts with a great CC FH pass. That was classic Jo. Completely in control, loses his focus, goofs around, and gets broken. 4-3, Gulbis: Ernests fires an ace, and he’s up 40-0. SW out wide, and he’s consolidated the break rather easily. 5-3, Gulbis: Jo starts his service game by DFing twice. Later, at 15-30, Gulbis plays incredible defense, but Tsonga plays a volley exo-style: right back at Gulbis (intentionally), and the Latvian duly passes him. An absolutely ridiculous moment from Jo-Wilfried Tsonga. In a very, very bad way. Moments later, Jo botches a volley, and Ernests Gulbis takes the set. I can’t believe Jo clowned around at Wimbledon like that. Exo-style. Ridiculous. Second Set to Ernests Gulbis, 6-3. Third Set – Ernests Gulbis will serve first. 0-0: Gulbis hits an ace for 40-0, but then DFs. No matter: Jo sends a slice wide, so the easy hold is confirmed. 1-0, Gulbis: Jo DFs, and it’s 30-all. He suddenly doesn’t have as much lift on his serve anymore. However, he does put away a short FH, so he has a GP. A good serve helps him hold. The commentators are now stating the obvious: Jo is not moving well anymore. Perhaps adjusting to the RafaWrap? Who knows. 1-1: A very good body serve seals a love hold for Gulbis. Like Jo, I have no idea what’s going on in this match. One thing is certain: Gulbis is serving much better now, and seems fully focused. Even the Jazz Hands FH has stopped leaking errors. Tennis is such a weird sport. 2-1, Gulbis: I went down to get breakfast, and that’s as long as it took for Jo to hold. Bear in mind, I just got cereal. 2-2: Ernests Gulbis holds at love rather easily. Jo barely making a play on some serves. 3-2, Gulbis: Jo is still not moving well, and playing sad tennis to boot. He’s down 30-40, but saves the BP after Gulbis slips while trying to hit a passing shot (which he did hit over the net, it should be said). Jo then makes another silly error, and it’s BP again for Gulbis. SW up the T saves it. Gulbis then wisely engages Tsonga in a BH-to-BH exchange, and waits out for the Tsonga BH UFE. BP again. Jo comes to net, hits a bad volley, and gets passed. Ernests Gulbis is up a break! Jo looks completely out of it, both mentally as well as physically. Yet it all looked peachy until he gave away that silly point in the game in which he got broken again at the end of the 2nd set. 4-2, Gulbis: Ernests did well to break, and now is essentially tossing away the advantage. Silly errors capped by a DF make it 15-40, double BP for Jo. The first is saved by a good serve, though. Rinse and repeat, and it’s Deuce #1. Then, a bizarre point, in which Gulbis hits a very, very soft pass, and Jo barely makes an attempt to get it. A good serve seals the hold for Gulbis. 5-2, Gulbis: Jo is having trouble getting some lift off that left leg for his serve…but has no problems going up 40-15. However, a bad UFE makes it 40-30. However, he does manage to hold. 5-3, Gulbis: Off great serves, Gulbis finds himself with double SP at 40-15. He nets a 2nd ball FH DTL. Then, a ridiculously good SW up the T to seal the set. Third Set to Ernests Gulbis, 6-3. And…Jo-Willy Tsonga pulls the plug on the match, citing his knee injury. A truly bizarre turn of events at Wimbledon today. This was the 7th (!!!) retirement/withdrawal of the day! How crazy is that? Game, Set and Match to Ernests Gulbis, 3-6, 6-3, 6-3 – RET. This was a strange, strange match. Which makes perfect sense given the very bizarre day that we’re having at Wimbledon. Jo-Wilfried Tsonga seemed to be in complete control of the match through a set and a half…and then lost control of it completely. Tsonga had chances to break early in the second set, then played a somewhat sloppy service game to get broken, and that was that, essentially. What I would like to state is that until the second set ended, moments after Jo-Willy smiled his way out of a mockery of a point at 15-30, 5-3 that he gave away, the World Number 7 looked to be in fine form. He was moving well, he was hitting the ball well, and seemed to simply be in the midst of one of his all-too-familiar lapses in concentration. However, after Jo called the trainer between sets and got his knee taped, his movement was significantly hampered. He wasn’t getting up to hit his serve, and little by little he started to show a slight limp. Near the end of the third set, Tsonga wasn’t even reaching for balls he normally would normally get to. As I wrote above, the retirement surprised very few. Lost in all of this is the fact that Ernests Gulbis achieved something that had eluded him before today: a spot in the third round of Wimbledon. I was very surprised by the way Gulbis battled through in the early part of the second set, and then firmly seized control of the match once Tsonga started to struggle. I thought that infamous 15-30 point at the end of the second set was emblematic of what was going on with Gulbis: Tsonga played that point as an exhibition, while Gulbis didn’t flinch, and gladly took what was being gifted to him. No smiles – all business. There was only one wobble in the third set for Gulbis, but given that he survived it with some clutch serving, it ended up being harmless. I was thinking during the first set that while Gulbis had decidedly looked like a top 10 player at Indian Wells, he sure hasn’t since then. However, I was very impressed by the way he took hold of this particular match, and how quickly he righted the ship in the two areas that were threatening him: his 1st serve percentage, and the forehand unforced errors. Of course, the question for Gulbis will be whether he can perform at a decent level in two consecutive matches. He’ll play a suddenly in-form Fernando Verdasco in the next round, which seems like a pretty intriguing test for him. As for Jo… we all hope he’s not seriously injured. He’s had issues with his knees before, so today’s episode can’t be a good thing. But for the life of me, I can’t understand what he was thinking in that 15-30 point. Just an inexplicably clownish moment in a Grand Slam match. 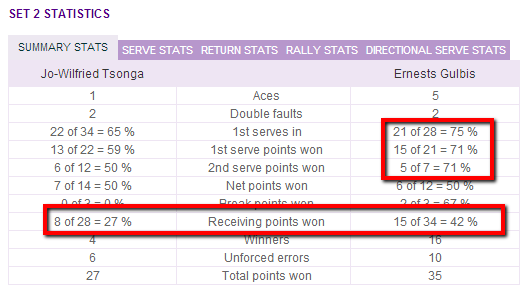 As I tweeted at some point, trying to understand Jo-Wilfried Tsonga makes my brain hurt. So I’ll stop now. Best matchup of the day, for sure. Hoping for Gulbis v2.0 to show up. No drama, no racket-smashing, just take care of business. JJ, any chance you can please keep an eye out on court 1 when Murray is playing? My friend Rendy is playing against Murray and I would love to get your assessment of Rendy’s performance.